Getting male high school athletes into the weightroom is usually not too difficult. They are excited about bulking up and getting stronger. With females, it can be a different story. There is often some hesitation. I’ve worked with female high school athletes for the last 33 years. I’ve found that the two main factors in getting them to feel comfortable with weight training are showing them how it will enhance performance and then educating them about how it will affect their body composition. To teach females how strength training will make them better athletes, I often point to professional women athletes who are working hard in the weightroom. Today, they aren’t hard to find. I also explain that the athletes they are competing against are likely weight training. The girls realize that in order to compete, they have to use every resource available to them, which includes strength training. The stigma around body composition has also changed considerably. Now most females realize that they do not have the testosterone necessary to bulk up like guys do. Also, an athletic build is more in vogue now than it used to be, so girls are okay with the idea of having muscles more toned. Use Peer Influence: For coaches looking to get their female athletes excited about weight training, it helps to have an established program where older athletes motivate their younger peers. When a younger athlete who has never been in the weightroom sees the older girls there, peer influence starts to play a positive role. Ideally, train your upperclass athletes to be peer coaches. It teaches leadership, and it helps younger girls who may feel more comfortable talking to a peer than an adult coach. 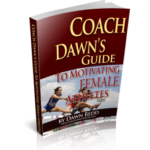 This method is a valuable way of getting all athletes started, but especially female athletes. Teach Them Well: I’ve also found it very important to carefully teach females the motion of different lifts before adding weight. This helps them become more comfortable and will ensure proper technique. With all athletes, but especially with females, it’s important that they go through different progressions. Start off with basic movements and have them work their way up to adding enough weight to really feel a change. Establish a Welcoming Culture: Another big part of getting girls to feel comfortable with weight training is creating a culture of acceptance within the weight facility. If a girl coming in for the first time is thrown in with a bunch of guys who are banging their heads against the wall and getting really fired up, that’s probably not going to be conducive to making her feel comfortable. Have females come in at times when there are only girls in the weight room. This is where using female peers can also help. They can help create the right culture and atmosphere within the weightroom for females. Show them Results: After you get them in the weightroom, keep them motivated by showing the results of their hard work. Just like with the guys, consider putting up record boards listing the top 10 girls in each lift. All athletes want to compete and see that they’re getting faster, jumping higher, and lifting more weight. When female athletes see that weight training is enhancing their performance, they start setting goals for themselves and get excited about lifting. My philosophy has always been that female athletes can do the same workouts that male athletes do. They keys are to create the right culture and show them their progress.